By the fourteenth century there were at least nine families in the village, for they are readily identifiable from deeds: Adam in the Lane, John Doget, William the Blakesmith, William Chapman, Thomas and William atte Wick, Robert the Shepherd and others. 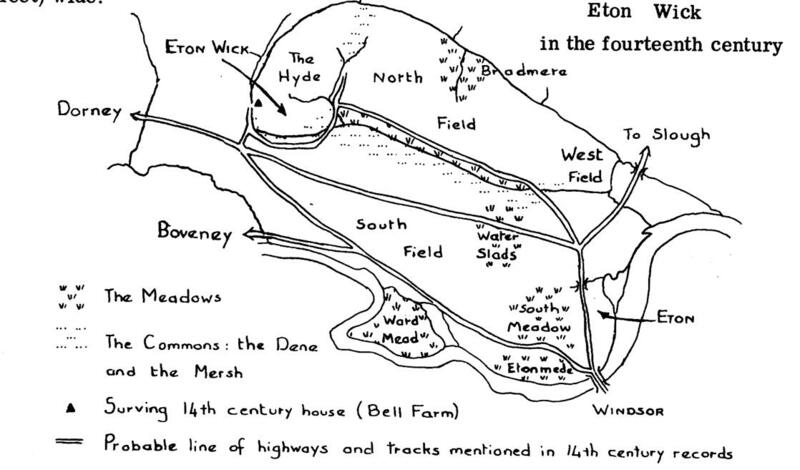 Where their homes are mentioned they would appear to lie north of the brook, between the field called the Hyde and the common pasture called the Mersh (or marsh) or near another called the Dene (or valley). These two areas or common still exist, though now perhaps a little smaller and known as the Great and Little Common respectively. Bradmere or Broadmoor was another area of pasture, but today this is arable and part of North Field. The meadows were to be found near the river and brooks, the Innings (today known as the Inner Ward Mead) lying parallel to the Great Common but north of the brook, the Wards, by Cuckoo Weir, and South Meadow. The thirteenth century and the first half of the fourteenth century was a period of land hunger and there is clear evidence of land being won from the areas previously considered too marshy to use, such as the Water Slades mentioned In a deed as land 'newly cultivated'. This land lies on either side of the Eton Wick Road near the Willow Tree public house where the land still dips perceptibly. The word slad(e)s can mean a hollow. In the eighteenth century there used to be a row of posts marked to show the depth of water lying on the road in the almost annual floods, giving warning to the carriages and waggons using the road. Even today there are still metal posts standing which were used during the 1947 floods. It is too much to expect to recognise any particular strip as surviving today. There has always been a certain amount of exchange and amalgamation as individuals found it more convenient to have their land in more compact blocks, yet right into this century strips are shown on the maps which accompany deeds and are separately itemized. The long narrow field just east of the College Sanatorium is the last strip of Broken Furlong in cultivation. The piece of land west of Haywards Mead, too, is part of an old strip that only became fenced in this century. In 1808 a Surveyor of the Royal Manor could write that 'there is hardly a hedge to be seen on the whole farm (Saddocks)*, and even today South Field is almost free of hedges with no permanent boundaries marking the boundary of the allotments or the land farmed by Mr. Paget, making these, perhaps, the last vestiges of the old landscape. Strip farming in the open fields was also practised in Boveney Parish. 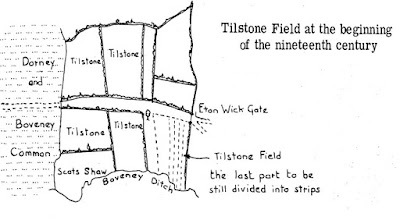 The part of Eton Wick that came under that parish was once part of the Tilstone Field and the Shepherd's Hut was built at the end of one strip in about 1830 when the rest of the field was still being tilled. 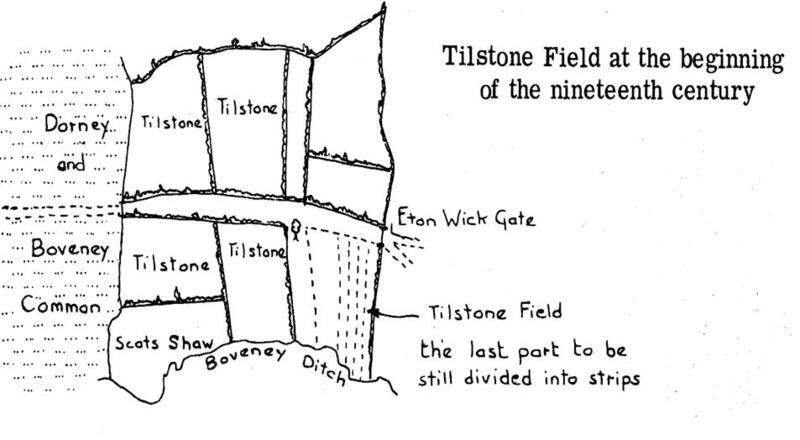 The name 'Tilstone' is intriguing; the earliest record of it occurs in a sixteenth century document when it was spelt 'Tyila's dene' suggesting that the name is derived from the dene or dip in the land owned by Tylla. No records have been found to tell us who he was. Rutted and dusty or muddy and full of puddles, the roads of the Middle Ages little resembled the macadam highway of today, yet already by the fourteenth century there was a pattern that is recognizable today. 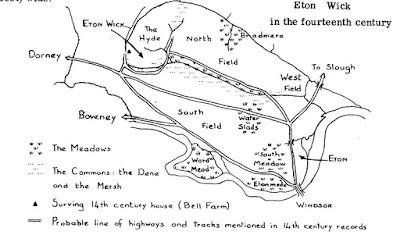 The Eton Wick Road was a public track though lying entirely within South Field. Bell Lane and Common Road were both being used, their route following the edge of the Great Common and the Manor boundary. Haywards Mead, crossing the South Field to Meadow Lane, Eton, was one of the "King's highways', as was another road running through South Field and roughly parallel with the Thames, leading from New .Windsor to Boveney. None as yet possessed their modern names; Common Road was BIakes (possibly Blacksmiths) Lane and one of those passing through the South Field by Cuckoo Weir was appropriately known as Mill Lane. Joiebalteslane is perhaps to be identified as the road running towards Little Common. The track which still runs north of the Great Common, alongside the Inner Ward Meads, was called Innings Lane. Connecting this track to Broadmoor and possibly continuing to Chalvey was Droflane. Though the position of this lane is not known, old maps of the parish show several footpaths crossing the North Field, and until the motor car changed the pattern of family life, these footpaths were regularly used by the people of Chalvey and Eton Wick. The Shepherds Hut Brewhouse, 89 Eton Wick Road. With the declaration of a two day holiday the nation commenced its celebration with church services which many attended to give thanks for victory and deliverance from tyranny. Flags and bunting appeared on the Tuesday morning in Windsor and Slough giving the streets a look of carnival. Celebrations had started quietly in the early part of the day, the crowds gathering during the early afternoon after the Prime Minister, Winston Churchill, had broadcast to the nation that all hostilities in Europe were at an end. Nightfall brought more people onto the streets to cheer and dance. Bonfires were lit at many places, with the Mayor of Windsor lighting a huge bonfire on Bachelors Acre, Windsor, the signal for the start of celebrations that went on into the early hours on Wednesday. Other hastily gathered bonfires appeared onto which went effigies of Hitler and his cronies. Eton College boys had commenced their celebration of victory on Monday evening when the first news of the surrender was heard. The use of buckets of water and stirrup pumps by the Boys did nothing to dampen the enthusiasm of revelers who had to run the gauntlet along the long wall and Keate’s lane. The next day they were given a holiday and immediately set about building a huge bonfire on Fellows Eyot which was lit in the evening. The scene was one of merriment with people dancing around the fire enthused with the excitement of the occasion. As the fire died away many boys linked arms to make a triumphant march up Eton high street to Windsor where they met another joyous crowd coming from Windsor making their way to Slough. Many of the boys carried on their celebrations with a triumphant march over Windsor Bridge to Castle Hill. The local Windsor and Slough papers reporting on the Victory Revels said that a two day holiday was declared and the joyous population danced, sung, cheered and wept celebrating the news. Church Bells rang out from Saint Georges Chapel and from all the parish churches around. It was a beautiful warm day with the temperature much higher than the average for the time of year. At nightfall the celebrations took off with a bang as rockets exploded in the sky. Men, women and children thronged the streets of Windsor, Eton and Slough in a night of sheer happiness that the war in Europe had ended. No more would there be anxious days when bomb or rocket would bring death and destruction. By late evening many of the pubs had run dry but the festivities continued to the early hours of Wednesday morning. No-one wanted to go home. The only floodlit building in Eton was the College Chapel but elsewhere floodlighting and fairy lights appeared. Among buildings lit were High Duty Alloys on the Trading Estate, Slough Town Hall and the Windsor riverside with colourful fairy lights. Army searchlights added to the illuminations. Villages around the district were also celebrating with bonfires and parties and impromptu dancing on the village greens and in the streets. The sky reflected the glow from the multitude of fires which in some villages were huge. The very large bonfire on the village green at Datchet commenced a night of celebration which continued through until Wednesday night when there was the added attraction of dancing to the music of the Royal Artillery band from the local Ack - Ack batteries. For many children this was the first time to see lights in shop windows and such an outburst of gaiety. Informal street parties and celebration teas for the children took place with tables and chairs and often a piano being brought from the houses. 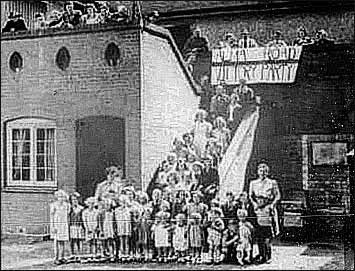 Street parties at Brocas street and Tangier Lane were arranged for the children who in addition to the tea were given an orange and one shilling. Mr. Addaway, driver of the Blue Bus, had a very excited passenger on V.E. Day. Streaming two strong wartime toilet rolls, Mrs. Downs, showing the joyfulness of the day, rode on the bonnet of the bus. Celebration parties at Eton Wick were quickly organized at Northfield Road, the Village Hall and on the common adjacent to the Greyhound public house. Precious tin food that had been purchased on points and stored for this day came from the cupboard. The Victory street party in Northfield Road, organized by Mrs. Harman and friends, entertained about twenty children and the same number of adults to a celebration tea with fruit salad from the Azores and a special iced cake in the shape of a victory "V". Private Mills, who was home on leave after three years overseas service, was guest of honour. After tea the children had dancing, races and games ending the day with three cheers for the boys still overseas and wishing them a speedy return. More articles on how Eton Wick celebrated Victory In Europe Day can be read here. This is an extract from Round and About Eton Wick 1939 - 1945 written by John Denham. While Eton Wick was celebrating the Victory in Europe May 1945 Signalman John Denham had become a front line solider in Burma following the reoccupation of Rangoon. Arthur was born on January 26th 1889, and probably did not move to Eton Wick until 10 years later. He attended the Windsor National School until he was 10 years old, and first registered at Eton Porny on February 7th 1899, leaving there on March 15th 1903 to take up farm work. No evidence has been found to suggest that Arthur was anything other than an early war time volunteer. He was 25 years old when war was declared and his Battalion, the 2nd South Wales Borderers, were at that time serving in Tientsin, China, where Germany had substantial influence. On September 23rd 1914 they were landed at Lao Shan Bay for operations in conjunction with allied Japanese Army Units against Tsingtao. Six weeks later, on December 4th, they embarked at Hong Kong, and landed in Plymouth on January 12th 1915. The Battalion moved to Rugely where they became part of the 87th Brigade, 29th Division, and on March 17th 1915 they sailed from Avonmouth to Alexandria, arriving in Egypt 12 days later. The 29th Division was the last of three Divisions formed in the U.K. with mainly professional soldiers brought home from overseas service and were often referred to as the C. in C. General Hamilton's, "Piece de Resistance". They were in fact the only Division available at the time for the forthcoming Dardanelles offensive without taking troops from the western front. During the war the S.W.B. had a total of 18 Battalions, but only the 2nd served in Gallipoli for the initial April attack. Three months later the 4th Battalion S.W.B. was also landed on Gallipoli. From the outset the campaign was poorly planned, suffering a severe shortage of drinking water, ammunition and reinforcements. Divisions sent to the Western Front had gone with an initial 10% reserve of men for casualty replacements. 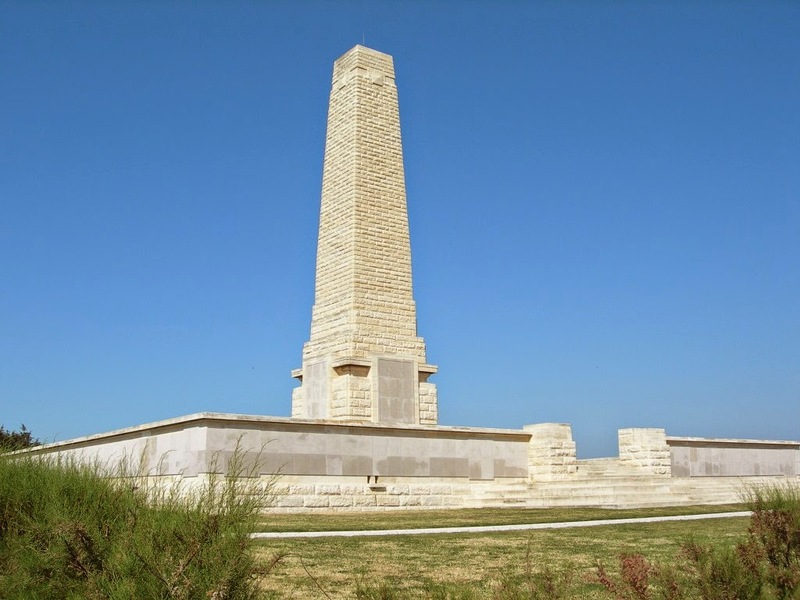 Despite the greater distance to send supplies and men, there was no initial reserve at Gallipoli. British, French, New Zealanders and Australians were landed at five beaches on the peninsula, starting the offensive on April 25th 1915. Three of the four S.W.B. companies went ashore at Hassarlik Point, Morto Bay, just inside the narrow Dardanelle Straits, intent on advancing inland, past the 88th Brigade and taking the Achi Baba Hill. The first day was reasonably successful and casualties were less than 100. Unfortunately the overall progress was not good and the Borderers were unable to break away from their beach head as planned. The Turkish defenders were always brave and determined fighters, with their many snipers taking a steady daily toll of the allied troops. By day five, April 30th, the 29th Division had suffered 4,266 men and 187 officer casualties for no appreciable advance. Three days after the S.W.B. had landed in Morto Bay they were fighting against fierce opposition along Gully Ravine in a combined, but unsuccessful, attempt to capture Krithia. All were very exhausted, and the shortage of shells and adequate replacements was proving too much against an enemy defending familiar terrain and receiving steady reinforcements. It was here, in front of Krithia, that Arthur Richards died. He has no known grave and so is commemorated on the Helles Memorial at the south west tip of the peninsula. It stands 100 feet high, and from its commanding position is a well recognised mark for shipping. The memorial records the names of 20,765 men who fell during the campaign between April 25th 1915 and January 1916 and have no known graves. In December and early January all allied troops were withdrawn. Arthur was a difficult soldier to research as, for some un-established reason, he chose to serve under a different name. His father's name was also Arthur, and when they moved to Eton Wick they lived in Albert Place, Common Road. There was another lad with the same name living only a few doors away who was five years younger. Perhaps because there were three Arthur Richards living so close together, he was prompted to serve as Arthur Richardson. The C.W.G.C. has no trace of Arthur Richards of the 2nd S.W.B. Fortunately the Regimental Museum in Brecon suggested and pursued the idea of an alias. They then located Arthur Richardson, whose next of kin was given as Eliza Richards of Albert Place, Eton Wick. They record his death as May 2nd 1915, although the local paper was at variance, giving the date as May 15th 1915. It is believed Arthur had one brother, and the family lived on in Albert Place for many more years. Arthur is also recorded on Eton Wick Memorial and on the Eton Church Gates. In both instances his name is correctly given as Richards. On the Helles Memorial he is commemorated as A. Richardson. The Arthur Richards page on the For King & Country website.